Well, I’ve been a very bad blogger recently, haven’t I? In my defence, the past month has been a bit chaotic. A few weeks ago I did something horrible to my back and I’ve had trouble walking, cooking and sitting at my desk – more or less pre-requisites for keeping this blog ship shape. By terrible coincidence, my Uparwali Chai partner, Laura also slipped three disks and has been flat on her back for a month. As we were both hobbling around like a couple of old codgers, we had to cancel a tea party – and as the weather is now getting a bit hot (it reached 40 degrees today) for any outdoor activity that doesn’t involve jumping in a pool I’m not sure when the next one will be. I knew things were starting to look up, though, when my fruit and veg man delivered a basket of mulberries last week and I suddenly felt up to a bit of kitchen play. 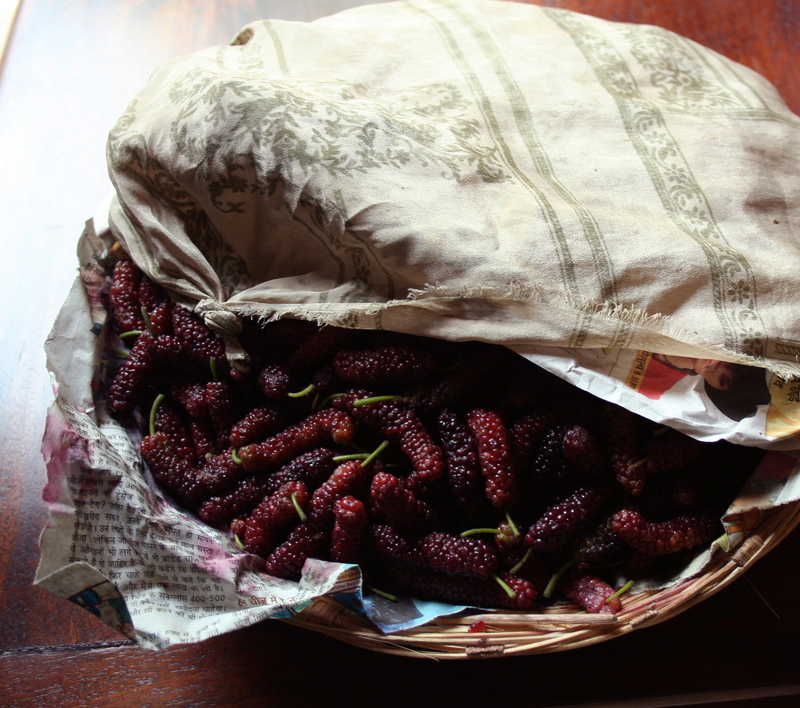 I love the very brief mulberry season: so sweet, voluptuous and indulgent yet perfectly democratic – the trees grow everywhere here – a quick shake of the trunk and you’ve got a glut on your hands. 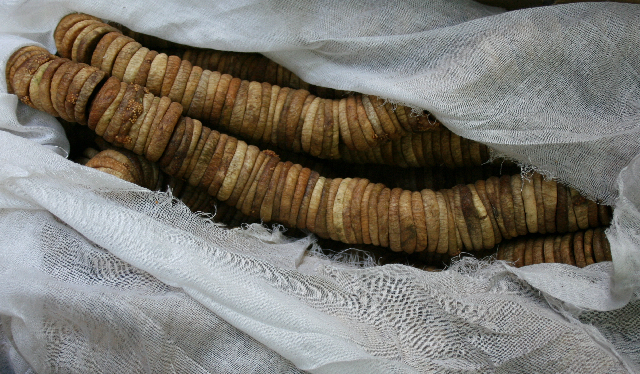 They have to be eaten quickly and locally – this is one fruit we’re never going to see in supermarkets in London – before they start to fall apart and ferment. After I’d gorged on the softly fragrant berries, I made some fluffy buttermilk pancakes which will appear in next weekend’s Mint column. I still had loads left so I decided to make a simple granita for friends coming over for supper. It turned out to be a triumph, with a little lemon juice to counterbalance the intense sweetness of the berries. Removing all the stalks is a pain – but worth it – if only for the intense colour, and the fact that you could still be savouring mulberries long after the season has been and gone. Gently heat the water and sugar until the sugar dissolves. 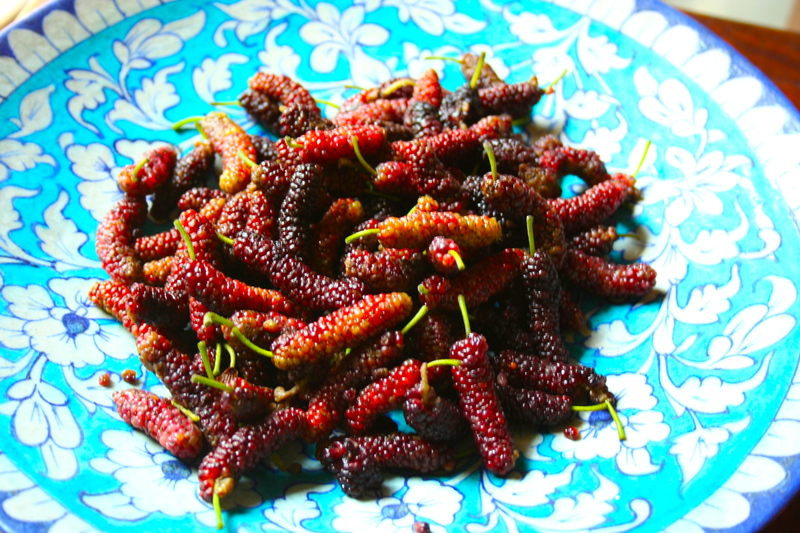 Add the mulberries and cook for a couple of minutes. Press the fruit through a fine metal sieve to remove the the seeds. Pour the mulberry liquid into a shallow plastic tub and put it in the freezer. 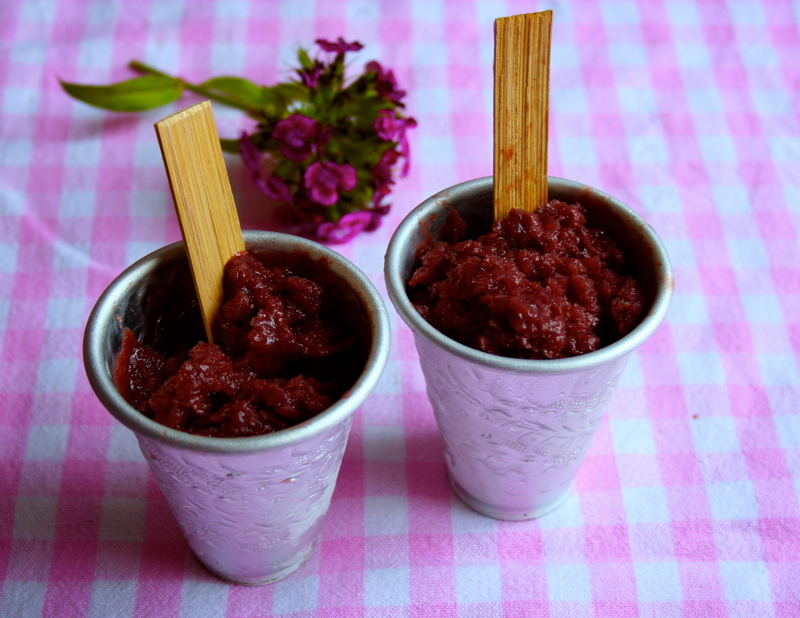 Every hour or so, take out the tub and rough the granita up a bit with a fork. Do this a few times, until it is completely frozen. Well, I seem to have got my va va voom back – no more excuses now! All my birthdays and Christmases came at once last Thursday when good friend Nita offered to help me explore the area around her family’s office in Khari Baoli Spice Market. Now, I never need much of an excuse to go to Old Delhi but when an insider offers to show you around, it’s time to drop everything and run! Three of us set off mid-morning for what would turn out to be one of my most memorable days in Old Delhi. We started at the Naya Bazaar end of Khari Baoli – Nita’s friend and foodie extraordinaire Anil, on holiday from his home in Paris, also came along and brought a certain ‘Je ne sais quoi’ to the jaunt. Anil has the most amazing ability to get people to behave naturally in front of the camera and I spent a lot of time pestering him for tips – hope something has rubbed off! For once, though, this wasn’t an eating trip, but a time to look, listen and try to scribble down as much as possible as fast as possible – Nita was wonderful at coaxing out the kind of in-depth information that my ‘tuta puta’ Hindi prohibits, and by the end of the day my head was swimming with the discovery of new foods, recipes, folklore and family history. We also returned home with a whole heap of new (to me) ingredients to play with. Wah kya bat hai? as they say in these parts!